Happy belated birthday to RIG exploit kit! First seen around April 2014, RIG has been in the news several times over the past year. In February, the source code was reportedly leaked online, which likely spurred some of the recent changes we've observed in the kit. ThreatLabZ has been keeping an eye on RIG and in this post we'll cover an example of a full RIG infection cycle. In the past, RIG used malvertising and compromised sites to send users to RIG landing pages and we've seen no change in this tactic. Compromised sites leading to RIG usually contain an iframe in the page header that loads a RIG proxy domain, which also contains an iframe leading to the RIG landing page. The full infection cycle is shown in the annotated Fiddler session below. 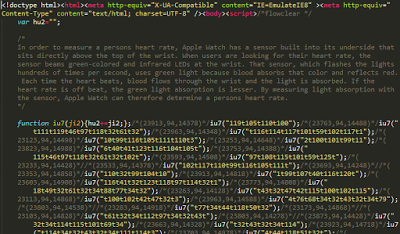 In this example, the compromised site actually contains three different malicious iframes in its header. These iframes correspond to line items 37-39 in Fig 1. Out of the three RIG proxy iframes on the compromised site, only one, sunfuji[. ]com, is still redirecting victims to RIG landing pages. Much like the iframe on the compromised site, the RIG proxy page contains an iframe redirecting victims to the actual landing page. The decode function for each of the three code blocks immediately follows the set of character-delimited strings, as shown in Fig 6. The deobfuscated first block of code attempts to detect known virtual machine characteristics and other attributes that might indicate an analysis environment. If anything is found, the next two code blocks are not deobfuscated or executed. This code is almost the same as in other exploit kits, and the URL of the encrypted binary is being passed to the SWF as a parameter. The exploit in this case was CVE-2015-0313, which affects Flash versions prior to 16.0.0.305, and the exploit code is contained in a script called 'wow.' Detection on VirusTotal shows 10/57, and there are several public writeups on this vulnerability. The binary payload is encrypted with an 8-byte key, which you can guess from the stream or retrieve from the deobfuscated VBScript. 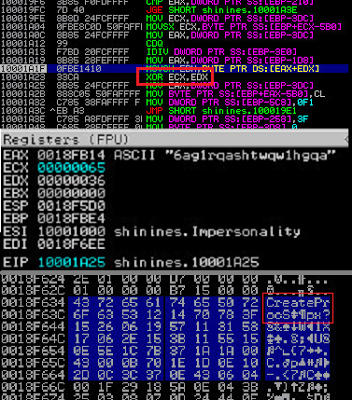 In addition to these three files, another executable 'b8.exe' is dropped. Once the installer finishes dropping files, it loads the DLL (15/55 on VirusTotal) and begins executing functions to read in the other two files. The file '6ag1rqashtwqw1hgqa' contains data XOR'd with the first 10 bytes of the filename, and the decrypted contents reveals several API calls that give us an idea of what will happen next, for example CreateProcessA, WriteProcessMemory, and ResumeThread. Similarly, the 'Stevie Nicks' .m3u is unfortunately not actually a playlist, but instead an encrypted binary that is decrypted by the DLL using the XOR key "ZhmGqqKwXmJiiS7dzjzPyyaTw0PANF". VirusTotal detection is 41/56 and indicates this is part of BlueBotnet. Looking at the binary, we see it's a .NET executable and uses no obfuscation at all to make decompilation difficult. 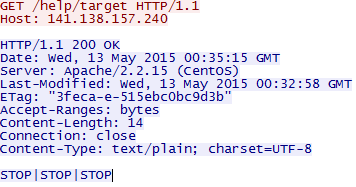 Looking at the namespace and classes confirms this is called 'Blue_Botnet' and appears to be a DoS tool. One of the more interesting functions is the 'updateTarget' function, which expects a pipe-delimited list of IP, port, and method. There are multiple different methods accepted for the 'target' command: UDP, TCP, SYN, MCBOTALPHA, HTTP, HTTPROXY, PRESS, and STOP. To perform its attacks, the bot has a list of 37 different user agent strings to make detection more difficult (paste of user agents); each request uses a different user agent from the list so requests look like they are coming from multiple different clients instead of from the same source. There is an Italian-language theme to the code, both in some of the variable names and in some of the HTTP headers, for example the Accept-Language header in the HTTP attack function shown below. Interestingly, the response from botlogger.php is not used in the code and the request may simply be a beacon to the server to keep count of infections. RIG continues to be a popular and effective exploit kit choice and has evolved over the past year, indicating active development. While other exploit kits are moving toward ransomware and adfraud for monetization of infected victims, RIG is apparently not following this trend and still pushes more traditional malware. ThreatLabZ will continue to monitor RIG for any new developments. For a look at the infrastructure supporting RIG, Trustwave has a great post on the topic.